Last night I did not want to work out. I sat in my car for 40 minutes trying to convince myself to go into the gym. I struggled through the workout and i REALLY did not want to do cardio after. I got on the elliptical and the first 3 minutes were hell. Every voice was yelling at me to get off, to go home, to quit, and that it was ok, every voice but one. I was a bit flabbergasted and taken aback, Rambo? Really?! I knew if I spent to much time questioning the voice then I would talk myself out of taking action. So I logged into youtube and turned on Rambo clips. Before I knew it, I looked down and 21 minutes had passed. I could have gone much longer too. During my dreams last night I heard the Rambo theme song. In a sea of voices that try to tell us all the reasons why we shouldn’t or we can’t, there will often be one amongst the many that will tell you that you can and exactly how. Seek out that voice and have a conversation with it. Listen to its’ guidance even if what it says may seem odd or unconventional. Listen. Then act. 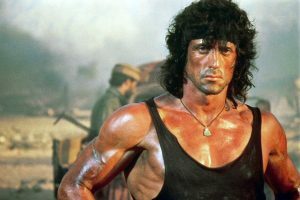 I would not have made it through the cardio without Rambo. I would not have made it past 3 minutes if I had not chosen to listen to the voice. In life, there will always be “voices,” the ones we choose to listen to will determine the quality of our life. If you want more out of life, consider listening to a different voice. Next When Will You Stop Lying to Yourself? Thanks for this Jesse. Its true that sometimes we hear voices and we ignore this, but we have to try to hear and listen the good ones, like yours !! whoah this blog is wonderful i like reading your articles. Keep up the great work! You realize, many people are looking around for this info, you can aid them greatly.